Get ready for a sensational day packed full of possibilities with the Marc Jacobs® Pack Shot. Backpack made of softly textured and durable 100% leather. Spacious opening with dual zipper compartments with colorful decorative tassels. Dual adjustable shoulder straps with a variety of decorative patterns and gold-tone chain links. 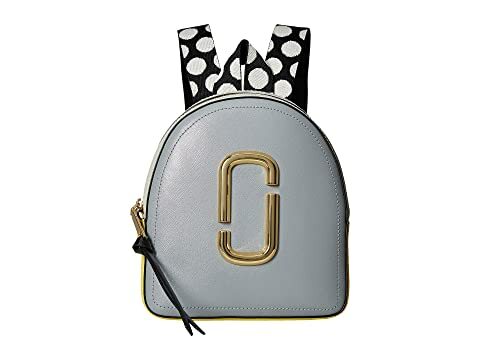 We can't currently find any similar items for the Pack Shot by Marc Jacobs. Sorry! I dig this bag. The bag eeclecticin design with the patterns and color blocking, and it is very sturdy, very well made. The straps sort of hang a bit wide off my frame, but I am somewhat petite. They sit out a bit so I sometimes have to adjust.If I adjust to the shorter length this mostly resolves the issue which is caused by the wider straps of the bag. Also, they need to lose the stupid chains on the straps. These are worthless on purses and backpack straps, and they looks cheap. I digress. This is a very well made bag for the cost compared to others in this price range like See by Chloe which are a bit more feminine and soft in the details, but those are just not as durable for someone like me who like a bag that stands up on it's own like this bag which can be wiped off if something gets on the bag, within reason. No harsh chemicals, of course. This bag holds up, and more than a few have asked me to borrow this bag. No, ladies, you may not borrow it from my collection. :) Recommended. I have the smaller 2 zip bag in this collection with guitar straps. Love them both!